The node ID is stored in EEPROM (the demo uses byte 0), so you only need to initialize ID’s once in each node. This code uses interrupts to do most of the work in the background for transmission as well as reception. The packet buffer is limited to 66 bytes of data. All packets are verified with a 16-bit CRC. Packets can be sent to a specific node (ID 1..30) or broadcast to all (ID 0). The demo code sends its test packets as broadcasts, but replies with acknowledgements to just the originator. Note that requesting an acknowledgement for broadcast packets only makes sense with two nodes. Update – instructions for the demo are now slightly different (see the README). Maybe I should clearify the ‘does not work’. I can load the sketch and set the node id’s. But send packets do not show up at the receiver end. Also the test package with ack gets no ack. Weird. Note that this driver runs at 57600 baud vs. 4800 for the previous code. Do you have ≈ 85 mm antenna’s? Are you doing the 3.3V / 5V level conversion with the Arduino? 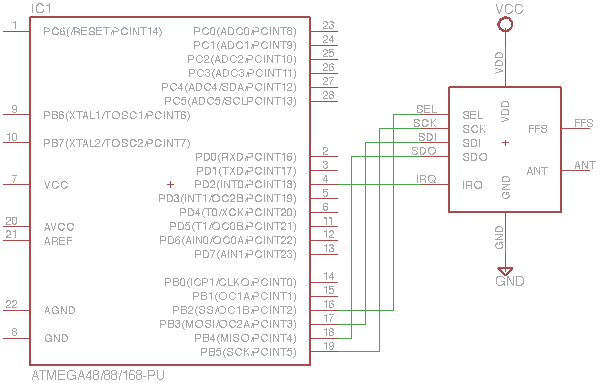 See the “Arduino + RFM12B + µSD” post for an example. I can’t think of much more, I’m using the latest code in subversion (now at Google Code) with a handful of setups. Works with Arduino IDE’s 12 and 13. One more thing: once you put stuff in hardware/libraries/, that won’t be re-compiled after a change. You have to switch board type and back to force the compile. Tedious. I’ll might give it another try later. I got your previous code running 100% now. There was an issue in the 3,3 volt from the RFM12B to 5 volt Arduino. I found out that slowing down the SPI speed fixes the problem. I have been looking around for suppliers of the RFM12B after first hearing about the device in an Elektor article a couple of months ago. HopeRF do them for $3 each samples or £2 each large quantity. But with a $22 carriage charge and customs charges to pay. lynx-dev.com in Germany sell them for 4.49 euro. Does jcw or others know of alternative suppliers in the EU who are cheaper than lynx-dev.com for this device? Thanks for that feedback jcw, I was not suggesting you should retail them BTW. If I find other suppliers in due course, I will let this blog know.